Sesiones de estudio y capacitacion gratuitas a los miembros de la comunidad para preparacion de la licencia AB 60. Como hacer una cita, tomar el examen escrito y preparar para el examen practico. Todos son bienvenidos. Study Circles AB 60 Driver’s License. Study sessions for community members to prepare for AB 60 licenses free and open to all. Guidance in making an appointment and taking the written exam and preparing for the behind-the-wheel test. All are welcome. The PEOC is recognized throughout the region, and increasingly throughout the state, as a leading immigrant rights organization in eastern Los Angeles County and the Inland Empire. 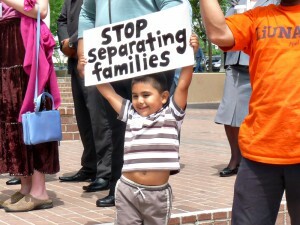 In 2009, we organized a successful campaign against the Riverside Border Patrol Station, which stopped the raids on day laborers by uniting a diverse coalition of supporters, developing a media strategy to call attention to quotas and racial profiling, and using legislative advocacy at both the local and federal levels. In 2008, we entered into a partnership with the Laborers Union, Change to Win, and the National Day Laborer Organizing Network to organize low-wage immigrant workers. We created the Day Laborer Congress of the Inland Empire made up of over 80 day laborer leaders to advocate for day laborers’ rights on a regional level. Jointly with local community leaders, we created the Pomona Habla Coalition in 2008, which has dramatically decreased the number of discriminatory driver’s license checkpoints in the city. A $10,000 grant the PEOC received from the California Foundation facilitated the initial development of a health education and outreach programs to the day laborers, put into action through collaboration of a part time day laborer health coordinator and volunteer Pitzer College intern. 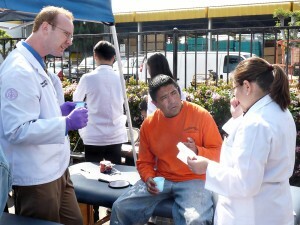 This primary phase of the health program resulted in approximately one dozen health presentations on a wide variety of preventative health topics, a carwash fundraiser raising over $500 in funds for an uninsured injured day laborer, the establishment of a day labor soccer team, and a free clinic where day laborers were given physical exams and clinic referrals. Hi, I’m in Riverside, but would like to know about any resources available to day laborers here. I hired a guy today who is obviously really bright, and I’d like to be able to refer him to a school, give him info about required documents, etc. He lives just down the street from the Madison/Indiana Home Depot. If possible, I’d love it if you could call me at (760) 443-8857. P.S. I graduated with my doctorate in the same class as Jesse Diaz, who used to be very involved with your center. I’m a current freshmen in UC Santa Cruz and I’m currently giving a class that prepares people for the driver’s license specifically AB 60 in the Santa Cruz community. I also just saw that this center provides classes to prepare them for the Driver’s license test as well and I was wondering if you could share what is the way, in which the class instructed by the center. I’m in seek of ways to teach and the content to teach, I’ve come across different problems and it would be good to know of the strategies and ways of others, thank you. Thanks for reaching out to us. Generally, we try to model Pedagogy of the Oppress in our workshops. We try to keep it open for people to input their own experiences so that their are multiple stories people can learn from. We have practice tests, 5 of them, that we use each week. People are encouraged to come all 5 weeks so they can go through all 5 tests. The person leading the workshop will ask a person to read the question and then ask everyone which they thought is the answer. Then they ask why they think that is the answer. Here, people can share stories of their experience driving. People are more likely to learn the answer if they here a story of somebody else getting a ticket for breaking that rule. The person leading can then answer the question, giving the right answer, why it is the right answer, and an explanation of the various forms it can show up on the test. On the actual test, the answers make come up in different and confusing forms, and people should be prepared for that. Also, we hand out DMV Driver’s manual. We tell them where each answer is and constantly encourage everyone to read and study the manual.